NBA Philadelphia 76ers Basketball Metal, Blue Letters License Plate Frame - NEW! NBA Philadelphia 76ers Basketball Metal, Gold Letters License Plate Frame - NEW! NBA Philadelphia 76ers Basketball Black Nylon Wallet - NEW! 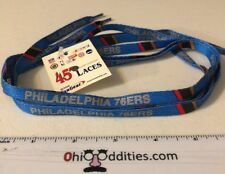 NBA Philadelphia 76ers Basketball Lanyard - NEW! NBA Philadelphia 76ers Basketball Black Logo Metal License Plate - NEW! NBA Philadelphia 76ers Basketball Baby Bib - NEW! NBA Philadelphia 76ers Basketball Luggage Tag - NEW! NBA Philadelphia 76ers Basketball Baby Pacifier - NEW! NBA Philadelphia 76ers Basketball Mirrored Logo License Plate - NEW! NBA Philadelphia 76ers Basketball Window Ice Scraper - NEW! NBA Philadelphia 76ers Basketball Sippy Cup 9oz - NEW! NBA Philadelphia 76ers Basketball Fleer Limited Edition Monster Truck - NEW! NBA Philadelphia 76ers Basketball #1 FAN Pennsylvania License Plate - NEW! NBA Philadelphia 76ers Basketball Block And Play Tie - NEW! NBA Philadelphia 76ers Basketball Golf Towel 12x16” With Grommet - NEW! NBA Philadelphia 76ers Basketball Baby Bottle 8oz - NEW! NBA Philadelphia 76ers Basketball 1.2 Ltr Insulated Coffee Pot - NEW! NBA Philadelphia 76ers Basketball School Fan Combo Pack - NEW! NBA Philadelphia 76ers Basketball Kitchen Combo 2 Towels - NEW! NBA Philadelphia 76ers Basketball Sports Towel 16x25” - NEW! NBA Philadelphia 76ers Basketball Hooded Baby Towel - NEW!